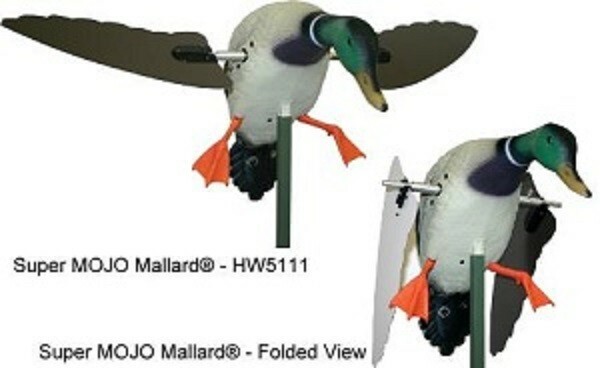 The Super MOJO Mallard Drake features a new all aluminum construction FOLDING wing in an offset posture. While spinning, the offset wing design is more realistic than anything ever seen on the market before, and more importantly, in the field. The folding wing design makes deployment or pick-up of your decoy up to four times faster than before. In addition, the Super MOJO Mallard has a built-in three position switch that allows the user to select the off position, the continuous on position, or the intermittent on/off position whereas the wings spin intermittently as it cycles through five different on/off sequences. Coupled with the offset design of the wing, it's unlike anything those cagy old mallards have ever seen before. 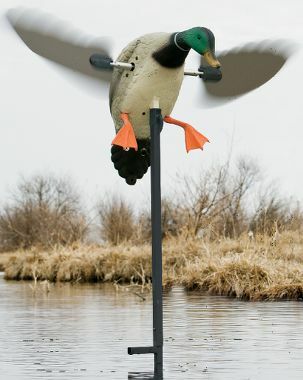 The Super MOJO Mallard is the absolute highest quality, most effective decoy made by anybody, anywhere...period. (Available in Drake Only).